Students in their final term are usually anxious to know what they need to do post-completion to either finalise their study at CQUniversity and/or apply for their next visa. Once your grades are formally released, the University will check your academic record to ensure you have met the requirements of your degree. Once we confirm you have completed your course correctly, you will be conferred (awarded) with your degree. Conferral Date is the date on which you are officially conferred with your award. This date will be printed onto your testamur (certificate) and official academic transcript as the date you are officially recognised as a CQUniversity graduate. After you complete your studies, but before you attend a graduation ceremony, you may need evidence that you have completed your degree. The Statement of Completion will confirm you have successfully completed your course. To request a Statement of Completion, complete the Statement of Completion (Graduating students only) eForm. It is recommended you submit your eForm after certification of grades, but before conferral date. Your Statement will be emailed to your student email account 5-10 days after conferral or your submission date (whichever is later). All transcripts are printed and sent from the Rockhampton Campus. To ensure your transcript is sent as quickly as possible, we recommend you apply online after certification of grades, but before conferral date (ensure you indicate you are a graduand when you submit your request). Once you have been conferred, a ‘My Graduation’ tile will appear in MyCentre. You will need to click on this tile to complete your graduation registration. You must register for graduation even if you choose not to attend a formal graduation ceremony. You may choose to attend any of our graduation ceremonies, or you can request for your testamur to be mailed to you. If you wish to attend a ceremony, it is important you complete your registration before the registration closing date. Please refer to the Graduation website for ceremony dates, registration closing details, regalia information and other important details. If you plan to remain in Australia once you complete your studies, you will need to ensure you apply for a new visa before your current visa expires. Once you are conferred, the University completes your CoE as you have finished your studies. If you have completed your course early, please contact the Department of Home Affairs (DHA) to ensure you do not breach your visa. The DHA website contains a list of visa options and document checklists. It is strongly recommended that you start gathering your required documents as early as possible. Any documents provided by the University will not be available until after conferral date. Therefore, they should be the last documents you require to submit your application. Most visa application will require you to provide evidence of your Overseas Visitor Health Cover (OVHC). This is a different type of insurance than what you currently hold as a student. 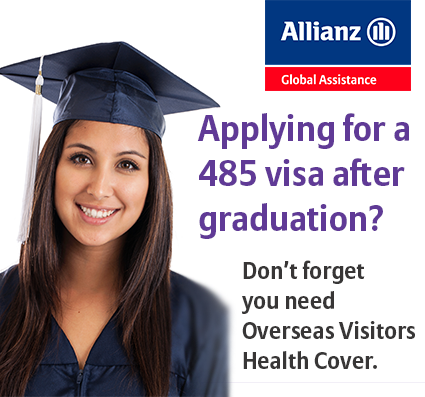 The University’s preferred OSHC provider, Allianz Global Assistance, also provides OVHC. A number of other health cover providers also offer health cover for overseas visitors. Benefits, membership costs and eligibility can vary between insurers, so do your research! If you are returning home once you complete your studies, there may seem to be a million tasks to complete before you board the plane. The Preparing for Departure Checklist will help you plan for your return home. In addition to complete the tasks on the Preparing for Departure Checklist, it is also important to prepare yourself for reverse culture shock. The common belief is that returning home will be easy compared to when you first moved to Australia. It’s a simple matter of getting resettled, resuming previous routines and re-establishing relationships. However, many international students returning home experience some degree of reverse culture shock. Through your study abroad experience you have changed and learned to accept and value new ways of thinking and doing things. You will discover that things at home have also changed and that the experience of returning home is different from anything you expected. You may go through periods of feeling unsettled after you return home, re-adjustment does not occur naturally and it will take time to settle in once you return home. While this is yet another challenge, you will look back with pleasure on the experience and skills that have been gained while abroad.